Designframe offers a professional and individual picture framing and design service for corporate and private clients alike. Designframe has recently relocated to Sturry, just outside Canterbury. 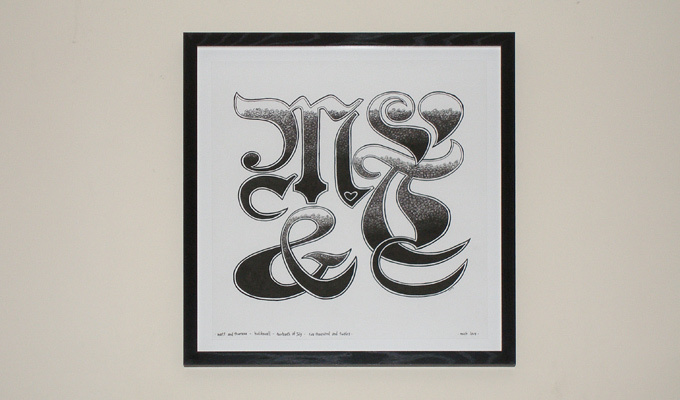 Operating from a small home-based studio, and originally based in North London, I began to offering my services as a professional picture framer after leaving a twenty-five year career within the Architectural Industry, where I specialised in concept presentation production and Graphic Design. I started Designframe in order to draw on my varied expertise in design presentation, and with a desire to offer traditional picture framing techniques with a special regard to customer requirements. I originally studied Fine Art, specialising in painting and printmaking, and have collected contemporary prints for many years. Along the way, I gathered a great deal of experience in the preparation, presentation and display of graphic work and concepts in various media - including work using video, sound and computer animation elements. After working for so long with computers and digital production methods, I am still deeply committed to the preservation of traditional techniques in art and design and, although I find great enjoyment in the `handmade` aspects of picture framing, I remain highly experienced and knowledgeable in digital production methods and print techniques. I am currently preparing to sit the exam for the Fine Art Trade Guild’s "Guild Commended Framer" (GCF) Qualification, and also study traditional Oil and Water Gilding techniques. The olympics in 2012 brought a few, more unusual challenges - and alongside the usual football and rugby shirts, appeared this Beijing and London themed pairing of T-shirt and romper suit! 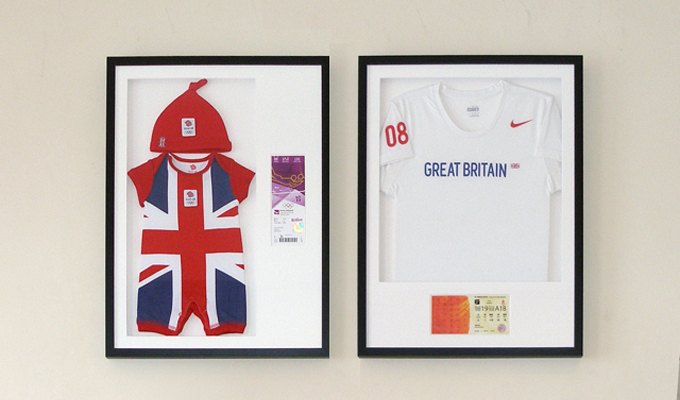 Both framed in matching box frames with the tickets mounted alongside. Now looking forward to see what comes back from Rio in 2016. 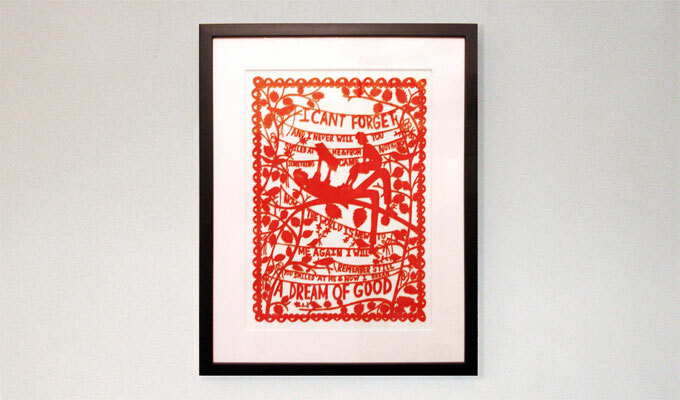 I went to Art School with Rob Ryan, so it was good to get a chance to frame one of his fabulous lasercuts. It's a straightforward enough frame, but I floated the lasercut in between two sheets of clear acrylic over a cotton board background, so it casts a very soft drop shadow. 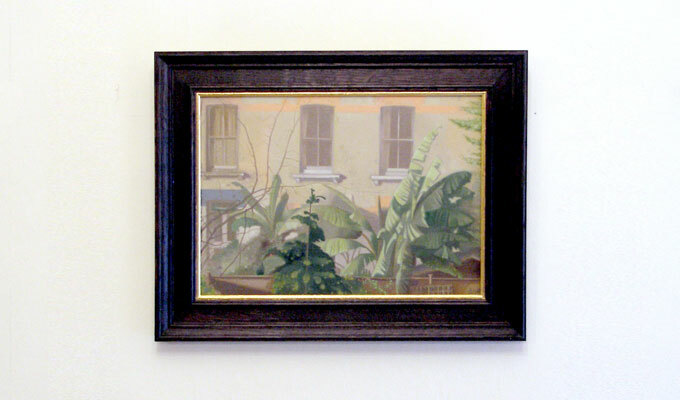 Another frame for London artist Alan Hardcastle, and another cassetta style moulding which has been custom stained a very dark tone. A gold sight edge with that? I'm currently working on a few pieces for Allan's upcoming exhibition at 54 The Gallery in Mayfair. Definitely worth a look if you're in the area. Ian Chisnall (Designframe) offers a professional, bespoke, picture and art framing service for private and corporate clients. He operates from a small, home based studio in Sturry, just outside Canterbury, but also continues to offer a service to some of his regular customers in North and Central London. Designframe is located on the A22, not far from the Sturry level crossing and is therefore ideally placed to serve commissions in Canterbury, Westbere, Fordwich, Herne, Herne Bay, Margate, Hersden, Broad Oak, Littlebourne and other locations throughout North and East Kent.